I “walked” to work today from the train. It’s only about 3/4 of a mile but yesterday I struggled to make it off the platform and down to street level before falling into a cab while holding back tears. So progress is being made very slowly. I won’t say my foot feels good but swelling is minimal and I have more flexion. I wanted to try to walk since I spent about $25 in cab fare yesterday to see if I could make it. I made it the entire way but it was very slow and I am very gimpy. I saw several runners while I was “walking” and I wanted to karate chop them it got me thinking, where are all the races for the injured people? I’m feeling pretty full of myself today, I think I’d have a good chance at an age group win. Watch out, there just might be a movement of motivated injured people to start a new race series. Hmmm….. This entry was posted in Randoms, Running and tagged Injured Runners, races for injured people by tootallfritz. Bookmark the permalink. Get better !!! until then, are there other things you can do? maybe swimming? I could not find it but I recently read an article about training while injured. The author suggested training around the injury. 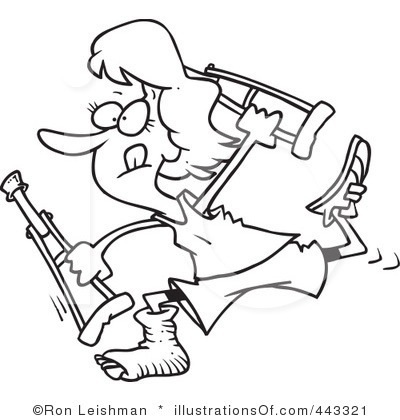 Make sure not to hurt/aggravate yourself but find things to work on that will not do damage to the injury. Yoga? What do you think? I know its hard to turn off the desire to train. I can swim and bike, just not run. 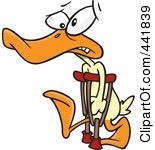 I’m not ready to ride yet though cuz I am not walking very well, in fact, I’m hobbling…..can’t put full weight on that right foot. I don’t have the power to pedal. I put my bike on the trainer last FRI b/c it was raining and I needed to ride so I think I’ll ride inside on the trainer for a while for safety reasons. I’m going to get back in the pool on THUR & FRI. A little at a time, I won’t be sitting on my bum but no running and that’s where it’s at for me. 😦 I’m missing out on a ton of races too…..70.3 Muncie (7/7) and I’m really struggling letting go of the 70.3 on Sept 1st but that will just be 12 weeks and that’s my return date for running if all goes well. Sorry to hear about that. Sux! Gotta live to fight another day though. I am said injured person 😉 Last winter I pre-registered for most of the races I wanted to compete in this year. Luckily for me (HA!) I had knee surgery in February which put those plans to rest. My therapist suggested contacting them not for a refund but rather to either help out during the event or just walk. Feb-Mar-Apr I helped out handing out water (not beer) and organizing. Now that I can walk a bit farther I’m out there getting in the ole fire breathers way on the course! The Injured Races is a great idea! There could be “points” for each injury — back pain (2 points), knee pain (3 points), crutches (4 points) etc…I think this is a whole ‘nother running series that you could start; the IR Races. Imagine the awesome medals you could design to give out for hobbling over the finish line. Sooner or later, we all have some sort of injury that puts us out for a while, so you’d have an unending flow of participants! Love your positive thinking! 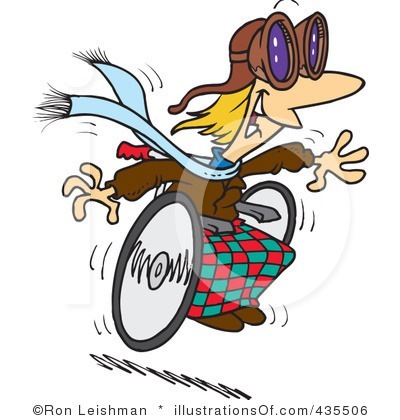 Wow…what about spending some big bucks on one of those racing push-rim wheelchairs! Most marathons have that as a division and ya get to start ahead of the elites! Not sure if half-marathons and shorter races allow them, or if you technically can enter a marathon in the push-rim event if you only temporarily injured. But…something to think about! Maybe ya can find a not-so-expensive used one. Just think of the upper body strength you will build! The races for injured people are team events!!! Thank you so much for your comment yesterday. Have you thought about changing your 70.3 entry to a team? You can still do the swim, that’s all I did when I had plantar faciitis last year. You could almost rope in another cyclist and runner from TTC! Things like this make us stronger in the long run. Look after your injury, and totally dream about karate chopping all the runners!! I certainly do lol. This is an amazing idea. OMGosh, thank you sooooo much. I think I can swim & bike by 7/7 and know a ton of people who could run the half. I’m going to check into it. Thank YOU! You’re more than welcome!!! I thought about doing this for another race, and they are normally more than happy to accomodate. You still get the experience of doing the race while nursing your injury. I don’t want you to miss out!!! Yeah, when I took time off for my minor injuries (no where near like yours), I wanted to trip every runner I saw. Hope you continue to feel better!